In balancing her art, work, and family, Lisa Macuja-Elizalde takes on life's challenges with discipline, elegance, and enduring positivity. She shares her story of inner strength and of living her prime with grace. How do you balance being a wife, a mom, and a prima ballerina? I always make it a point to bring my kids to school. I try to get work (for Ballet Manila or for myself) done in the morning, then I teach the ballet company and do rehearsals in the afternoon, sometimes spilling into the evening. Evenings are spent usually at home with the kids and my husband, and Sundays are strictly for family. I am busy but I think it helps that I have been dancing most of my life - I have the stamina to take on the workload. What made you choose to build your career and start your own ballet school in the Philippines, rather than abroad? I was blessed with the opportunity to study in the best and one of the first classical ballet schools specializing in the Vaganova technique. I thought that it was like a sacred duty for me to pass this on to the next generations of Filipino dancers so I started the Ballet Manila School. How did the self-discipline and commitment instilled in you by your ballet career help you in your journey as a mother? It's important to keep a schedule and stick to a routine. It's also important to always work hard, give 100% and to strive for the ideal - to strive for perfection - but also important to acknowledge the fact that perfection will never come because there is always room for improvement. These are the golden rules my dancing career has taught me that I also apply to being a mother and wife. How has ballet helped you celebrate yourself at fifty? Ballet for me is a great way to stay fit as well as keep my creative spirit alive. It gives me the opportunity to express my feelings and relieve stress through dancing. You're an Overnight Elixir user! What do you love about it and your other Human Nature favorites? What I love about Overnight Elixir is it's true to its name - it really works overnight! I see the difference when I wake up! I also enjoy Sunflower Beauty Oil, Cleansing Oil, Hydrating Creamy Wash, Hydrating Face Toner, and Night Moisturizer. I also use the Moisturizing Conditioner and Clarifying Shampoo - I use a lot of Human Nature products! Beauty and vitality shine from those with inner strength, potent and powerful in its simplicity - just like Human Nature's Overnight Elixir. Lisa Macuja-Elizalde became the first Filipina Prima Ballerina, and the first foreign soloist to join the prestigious Kirov Ballet in St. Petersburgh, Russia. She is currently the Artistic Director of Ballet Manila School based in the Philippines, where ballet professionals train in the Russian Vaganova method. 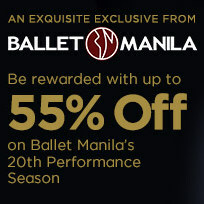 For a limited time only, Human Nature customers will get to enjoy up to 55% off tickets to Ballet Manila's From Page to Stage: The 20th Performance Season!